Feeling shamelessly self-indulgent? Wanting to educate your friends? Trying to start a cult? Why not throw a celebrity obsession party! We did. The biggest task will be creating the video. You need a video that will be at least 3 hours long and a comprehensive overview of your Obsession's career. Putting this video together will take many hours, but it's so worth it! You can sell your bootleg video later on Ebay and cash in. To make the video, you will need to gather all the movies, TV shows, videos, etc your Obsession has appeared in and choose your favorite clips. Obviously you will need two VCRs to then illegally copy these scenes into your compilation tape. It's good to sprinkle news stories, infomercials, Barbara Walters' interviews, Oscar acceptance speeches, or other specials features on your Obsession throughout the tape. Generally you will find your tape growing to the length of the entire North and South miniseries (Book I and Book II) because it's so hard to limit yourself to one scene per movie or one video per album--after all, everything your Obsession has ever done is BRILLIANT! Next prepare an enticing invitation. Promise food and booze. This will be the only way to lure your friends who couldn't care less about your Obsession. The night before the party, prepare recipes from your Obsession's cookbook and refrigerate. If your Obsession is one of the rare celebrities without a cookbook, be creative. Prepare foods your Obsession eats in the movies or thematic dishes based on the movies or songs (ie, Ham sandwiches if you are obsessed with Babe the pig). Decorate your party room with posters of your Obsession and assorted memorabilia from your collection. Spread biographies and magazines and your scrapbook on the table for guests to peruse. There will be one or two truly open minded guests, if you're lucky. 6-15 people who think this is actually a "party" in the sense that they're supposed to "talk" and catch up on non-celebrity-obsession-in-question related gossip. Curse a pox of fat-free-muffin-induced-constipation on their houses! The final thing you need to prepare is yourself. This will be the night that tries your soul. While offering you perverse pleasure, The Celebrity Obsession Party will bring its share of pain. Learn from our stories-we've been there. As I always say, you can always tell who your real friends are when you throw a celebrity obsession party. They'll be the ones who stay long into the wee hours of the night through the six-hour video montage that took you 10 sleepless nights to compile. The montage everyone else fast-forwarded their judgments through. They're the friends who give really good overview commentary and thoughtfully recap the night's obsessive events at 2:30 in the morning. They even stick around for one more round of "Gypsies Tramps and Thieves." If you're looking to convert your buddies over to a refined appreciation of your lifetime celebrity obsession by showing them concrete examples of a particular celebrity's talent, range and sentimental repertoire, snap out of it! That is a futile, heartbreaking exercise in being futilely stupid. A bit of history, if I may: my obsession all began when I was about five years old and decided I liked glamour-deadpan-and-berating-your-husband type variety shows. Cher's was the only one to fit the bill. I started collecting records, doll outfits, precious memories. My parents and brothers mocked me, as parents and brothers should. But I gave nary a care: Cher was riding high in the mid-70s, the kids loved her alright. I took my Cher doll to show-and-tell and she was the most popular toy along with Stretch Armstrong. But such is the price of popularity, the rabid, sadistic kids accidentally broke off both of her hands and punctured Stretch Armstrong so that he expired with one long, high-pitched, melancholy sigh. Nobody promised that fame should be easy. When I was seven years old, we moved from Albuquerque to St. Louis. My new friend, Krissy, was surprisingly open to the off-beat things I adored and bought up Cher and Bill Cosby records to match mine. But alas, Krissy was a year ahead of me and when she moved up from grade school to junior high, she dumped me in the discount bin like a remaindered Cher LP. Cher, by this time, was very, very, so utterly very un-cool. This was the early 80s and she was treated like a KISS-groupie, a Vegas has-been. I figured it was time to move on. I didn't want to do it but I had to venture out and make new friends. I had to grow up and shed all the fond accouterments of my childhood, including Fisher Price and Cher. So from the 6th to the 8th grade I was not a Cher fan. This was a very dark time, as you can imagine. I was floundering in a purgatory of no-good-friends. I had friends, but I wasn't connecting with them and I was feeling insecure. Soon it occurred to me that I wasn't appreciating me for my uniqueness and part of my uniqueness was my countless number of eccentric likes and dislikes. I started to celebrate me. I redecorated my bedroom from top to bottom. I redid my father's old childhood furniture, sweating and sanding a dresser and a single-bed one humid St. Louis August. I picked out my own wallpaper after first scraping all the old wallpaper goo from my walls and then adhering to Jessica Lange wallpaper selection admonitions in Tootsie. I also spent weeks scraping old carpet residue that had been glued down to my hardwood floor. I scraped with a paint scraper for hours and hours while watching Cher in Come Back to the Five and Dime Jimmy Dean on Showtime. Cher was making a comeback, as a matter of fact, as a bona fide actress and I simultaneously went through a period of Cher Renaissance, tracking down old magazine articles, completing my record collection. All this stuff eventually ended up on my Cher wall, opposite the John Waite wall, perpendicular to the short-lived Barry Manilow wall, inspired by my friend Christy Williams' Duran Duran wall. I made a new group of friends that year as well, nutty creative types just like me. They accepted my eccentric Cher collection not only because they had celebrity obsessions of their own but also because it was different. It was not part of the mandatory celebrity obsession teen-age dictates of the time (which included Duran Duran, Paul Young, Howard Jones and The Thomson Twins). My friends, Lisa, Nellie (above), Paul and Rand preferred uniqueness and not the usual boring high school sameness that everyone else demanded. 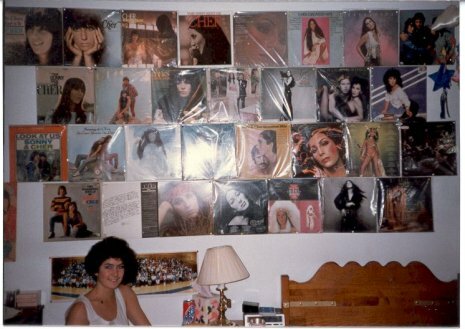 Nellie, Lisa and Paul even picked out their favorite pictures from the Cher wall and brought me memorabilia whenever they came across any. When I went to college I was still a fan but less enthusiastically. These were Cher's ballad-rock, Diane Warren & Mermaids years. Not as fascinating to me and I gave up, once and for all, the prominent display of fandom for a more low-key, intellectual fandom. Celebrity obsession was starting to seem a little creepy and misguided. I saw other people with their celebrity obsessions and they struck me as a little hysterical and irrational about their obsession. They freaked me out. So I phased back, and new acquisitions to the memorabilia library now go straight into basement boxes. In graduate school at Sarah Lawrence College, where literary readings are good and television is bad, I met Julie Wiskirchen and Christopher Brisson, two pop culture devotees, who likewise had scaled-back celebrity obsessions of their own. We formed a casual celebrity obsession outreach program and support group among ourselves and sinfully enjoyed re-wallowing in our pop culture obsessions. And here is where the celebrity obsession as party came to be. Following on the success of Mary's Cher party, I decided to throw a Jack Nicholson party despite the fact that I don't know any other Jack fans and my friends' reactions to Jack range from indifference to outright disgust. I went home over Christmas and rummaged through my childhood room for all my old Jack videos. It took a week of late nights to plow through all the old interviews of Jack's co-stars on Entertainment Tonight and Today, all the movie previews and commercials I'd taped, not to mention the 58 movies, all of which I had on tape and needed to include. At the end of all that rewinding, pausing, and fast-forwarding, I had a 5-hour compilation. For the party, I made recipes from Cooking for Jack, a cookbook by Jack's personal chef. Most of the recipes were too complex or required a food processor which I didn't own, so it took some time to choose simple ones. I fanned my Jack magazines across the coffee table and wore my old faded Joker T-shirt. Guests arrived and immediately began to enjoy the Prizzi's Honor lasagne and chianti. The Nicholson fat-free muffins were also a hit (much, much better than Cher's recipe), while Jack's favorite rice pudding was somewhat less successful. 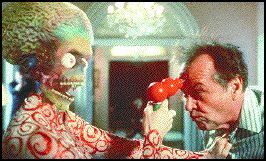 People watched the tape and were amused at some early highlights such as Jack's bit part as the masochistic dental patient in the original Little Shop of Horrors and his appearance as Stoney the pony-tailed guitarist in the hippie drug flick Psych-Out. It wasn't long before people starting talking amongst themselves and not paying attention to the tape. It's a party after all so I guess some socializing is to be expected. I tried not to let it bother me. Then people started grilling me: "Just why do you like Jack anyway? Explain yourself. Don't you think he always plays the same role? He's playing himself in every movie. Doesn't his chronic womanizing bother you? He's old, fat, ugly, and gross." My obsession isn't easy to explain or justify but I found myself having to do exactly that. People weren't shedding their preconceived opinions of Jack and they weren't watching my tape closely enough to be enlightened. Quite a few people left before we even got to One Flew Over the Cuckoo's Nest and only Mary and Christopher and the Gentleman of Leisure stuck around til the bitter end of the tape. Mary and I could only commiserate. People just don't understand! In the end, I decided I couldn't fault my friends for their reaction--they were gracious enough to come and endure a night devoted to someone they don't like just to indulge me. For me, Celebrity Obsession is a solitary pursuit. I didn't win any converts to the Church of Jack. I was left to soothe my emotionally exhausted self with a big bowl of rice pudding. I expect your experience will be quite different if you're in love with N'Sync and you have many like-minded friends to invite to your party. My party was more of a "Dancing with Myself" experience, but I had a good time. Just keep your expectations low and you'll have a good time, too. Remember, you can pick your friends and you can pick your celebrity obsession and you can force-feed your celebrity obsession to your friends for one night but you can't stop them from throwing up fat-free muffins all over you. Have you thrown a celebrity obession party? Tell us about it.